Ven a descubrir la magia del antiguo barrio judío. Paseando por sus calles se pueden ver construcciones del siglo XII, como los Reales Alcázares o edificios tan emblemáticos como la Catedral, el Archivo General de Indias, el Hospital de los Venerables y el Ayuntamiento. Entre las callejuelas que recorren como ríos el barrio, nos encontramos además con las iglesias del Sagrario y la de Santa Cruz. También sobresalen en el recorrido dos conventos, el de San José del Carmen y el de la Encarnación. Todo ello acompañado del típico colorido de los zócalos y el olor a azahar de las calles sevillanas, hacen que este paseo sea ineludible para el visitante de Sevilla. Discover the magic of the old Jewish quarter. Walking through its streets you can see 12th century buildings, like the Royal Citadels, and symbolic buildings, like the cathedral, the General Archive of the Indies, the Hospital of the Venerable and the City Hall. Among the narrow streets that cross the district like rivers, you will also find the parish churches of Sagrario and Santa Cruz. Two convents on the route are also outstanding, that of San José del Carmen and that of La Encarnación. 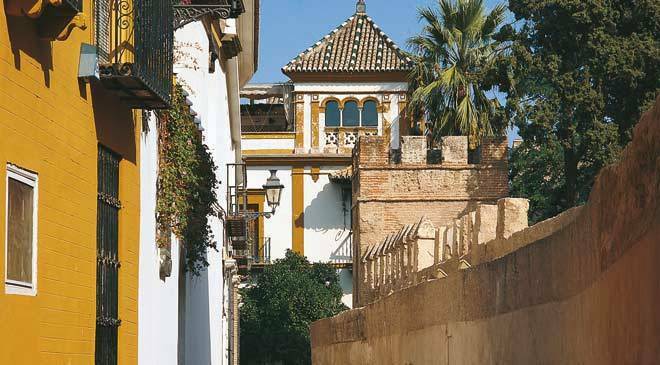 All this accompanied by the typical colour of the flowering walls and the smell of orange blossom of Seville´s streets, making this walk one not to be missed for visitors to Seville.